If you are looking for a new hobby, would like to meet some new friends or are looking for a venue for regular meetings, groups or classes or for a one off special occasion please get in touch and see what we can offer. 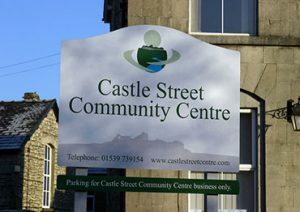 Castle Street Centre is run by a Charitable Association which is self-financing and receives neither grant nor outside funding. It relies heavily on volunteers and the support of those who use it. If you or anyone you know is able to offer any help we would be delighted to hear from you. The Centre is available for hire 7 days a week between the hours of 0800 and 2200. Our office is open between 0900 and 1630 Monday to Friday to deal with any queries or enquiries that you may have. We have a wide range of facilities to suit all needs, from our multi-function Main Hall, to our Art room and Meeting room. We can cater for groups of up to 40 people and our newly refurbished Kitchen provides superb refreshment facilities. For more details click below to find out. Our facilities are available for use by a wide range of groups and activities. Regular groups listings are available by clicking here. If you have a group or are interested in using our centre please contact us to discuss your needs further. Based right in the heart of Kendal Town Centre, our location is ideally placed. With facilities for hire and a diverse list of groups and clubs attending the Centre there is a great deal on offer all in one location. Whether it’s Toddler Groups or Taekwondo, Flute Group or Fit Pump, Castle Street Centre has something for almost everyone. If you have something that we don’t offer, get in touch and see what we can do to help organise it.